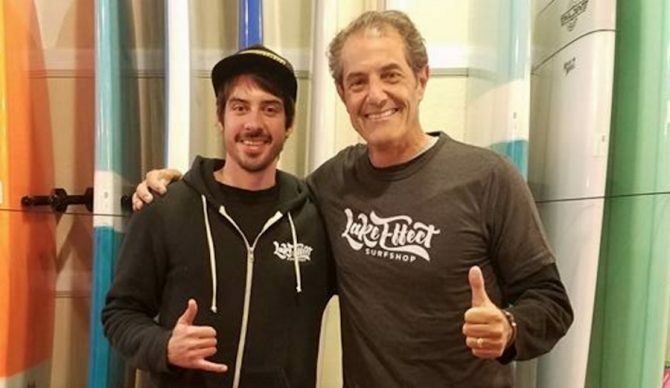 It was a Sunday morning like any other at Lake Effect Surf Shop, my newly opened business in Shorewood, Wisconsin. Surf shops aren’t common around here for a good reason, but business had been going surprisingly well the day before, and there was plenty of work to do. I unlocked the doors a few minutes later than expected and immediately dove into my opening duties: computer on, thermostat up, lights on, sand-covered carpets vacuumed, receipts from the day before counted and logged. Just then, a call came in on my business line. I picked up the phone, happy for the call, but disappointed at the timing – we had just opened. I’ve had a lot of “firsts” opening up this surf shop on the shores of Lake Michigan, but this one topped the list. What kind of California surfer flew to Milwaukee to hang out with the local surfers? He had briefly mentioned his name at the beginning of our conversation, but it had been lost in his accent and the howl of my vacuum cleaner. Is this a prank? Do I have time for this? I wondered. I scrolled through my cell phone, hoping to provide him with the contact information for Eric Gietzen, longtime local surfer and chairman of the Surfrider Foundation’s Milwaukee Chapter. I asked for his name again. It has been said – by philosophers and wise men – that there’s no such thing as luck. Luck, they say, is really that moment you find yourself at the intersection of preparation and opportunity. When that happens, they say, when you arrive at that intersection, it’s best to slow down and look around. That’s exactly what I did. Briefly, just for a second or two, I looked around at everything I had prepared. I looked at the posters on my wall, the neatly stacked clothes on my shelves, the quiet surfboards arranged on the rack I built only a few months prior. Immediately everything changed. Preparation had met opportunity and I assured him that I would be able to get a group of fresh water surfers together and made plans for everyone to meet at the shop that evening. More thoughts ran through my head: Why was Shaun Tomson coming to Milwaukee? How did he find my business? Why was he here at the end of November and not the summer months like most visitors? Before I let another thought cross my mind, I called every local surfer I knew, letting them know that an icon of surfing history was coming to town and would be at my shop later that evening. The rest of the day buzzed by in a cloud of excitement and anticipation. Shaun arrived at Lake Effect a few minutes before 6:00 PM, even earlier than promised. 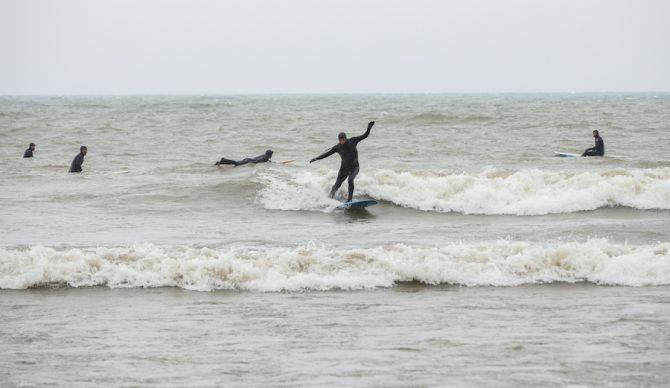 I was able to gather a dozen local Great Lake surfers to greet him. After arriving, I offered him one of our Lake Effect t-shirts, which he immediately put on with a smile. He was kind enough to take photos with everyone and share his stories with us. We all gathered around and listened to him speak about his book, The Code, some of his most memorable surfing experiences, and lessons from his personal life. He discussed his mission and values, explaining that he was here to speak with schools and leadership groups about his story and positive message. I was struck by how kind, genuine and sincere he was. For a surfer of his significance to take time out of his schedule to meet with us speaks volumes about his character and his stoke for the sport of surfing. He spent time answering our questions, taking photos, and signing autographs. Before leaving the shop for dinner with the whole crew, Shaun grabbed a black marker and signed an empty spot on the wall behind my register: Shaun Tomson was here! 11/27/2016 Stay Stoked! Over pizza and beer, Shaun revealed that he had an available window of time the next afternoon and that he would love to join us for his first fresh water surf session. Mondays were my self-appointed days off, so my schedule was wide open. Was it just luck, or the simply intersection of preparation and opportunity? In any case, I was prepared make Shaun’s generous visit worth his time and effort. Comparing images of the coming swell on our phones, we made plans to meet at Lake Effect around noon, assuring Shaun that we would have him plenty of neoprene to keep him warm, plenty of waves to keep him smiling, and a swell window that would have him back to his hotel in time for his evening event. Needless to say, it was hard to get to sleep that night. It’s not every day that you get to meet a surfing legend, let alone host him at your home break in Milwaukee, Wisconsin! As I fell asleep, I could hear the wind building outside and I realized that, in many ways, Shaun’s timing was perfect: his visit to Milwaukee coincided with the recent opening of my shop, my weekly day off, and the arrival of a new swell. The next morning Shaun’s impeccable timing struck again. The next morning I found myself in an impossibly long line at the DMV. As the line inched forward and I approached the “up next” position, I noticed a stern sign at the counter, “No phones allowed at the counter.” I laughed to myself, thankful to have this chapter of my day almost finished. Looking down to arrange my papers, I noticed my phone light up: Shaun Tomson. Perfect! I immediately dismissed myself from the line and stepped out to the hallway to take the call. “Are we still on for surf this afternoon?” he asked. I confirmed that we were, and gave him final assurances that my stock of neoprene would keep him warm for the session. I happily abandoned my business at the DMV and headed back to the shop to prepare for his arrival. Once inside, I gathered water bottles, towels, wax, and other surf essentials to make sure his experience at our local break would be at least passable. Moments later, I glanced out the window to see a brand new, black BMW pull up in front of Lake Effect. What happened next was perhaps the most formal arrival of any customer I had, and probably ever will witness. While Shaun spoke on the phone, his well-dressed chauffeur waited patiently outside the car door. Emerging from the leather bound interior, he tipped the driver and, smiling, entered the shop. As I showed Shaun the way to his wetsuit “fitting room” (Lake Effect’s garage), I thought hard about how I might provide the same level of service in my 2000 Chevy S10: Had I vacuumed? Had I cleaned off the sticky gunk on my dashboard? Would the CD player work? Would the truck even start? Before I could consider another question, Shaun emerged from the garage head to toe in neoprene, same big smile stretching from ear to ear. “I’ve never worn gloves before” he said, marveling at the neoprene technology cloaking his hands. As we climbed into my pick-up for the moment of truth, I uttered a brief prayer in my head, put the key in the ignition, and turned it. To my relief, the truck started, and we headed for Atwater Beach just a few blocks down the road. When we arrived at the beach the waves were not quite as big as I had hoped. The forecast I had seen the night before appeared to be a sizeable swell – shoulder to head high, but with the lakes, things can change in a heartbeat. What we saw as we looked down at the beach was a downgrade: still something you could surf, but smaller than expected: clean, waist high, with some organization but less muscle than I had hoped. Shaun didn’t seem to notice the downgrade. Peering over the lookout, he could not stop smiling as we watched a few members of the freshwater tribe already out catching waves, sliding easily across clean faces ushered in by a recent storm and sandbar combo. Stepping down the long stairway to the beach, I again noticed his ear to ear smile and heard the excitement in his voice. After snapping a few quick photos in our wetsuits, Shaun, a few local surfers, and I rushed into the water. After a few minutes, we noticed a set come up on the horizon. “Here we go!” I called out, with excitement in my voice. We watched as Shaun paddled, jumped to his feet and caught his first freshwater wave. The real moment of truth. He rode with his classic style dropping a knee on turns and throwing his hands in the air in that signature albatross style I had, until now, only seen in pictures. At that moment, the blue highway of Great Lakes surf history intersected with the remarkable trajectory described by Shaun Tomson’s life. My waterborne tribe cheered and hollered as Shaun glided down the face of the wave, watching him ride it all the way to shore. When he paddled back out to the lineup his smile was larger than it had been before. They say that poetry is emotion recollected in tranquility; 24 hours later, to hear Shaun reflect on that moment, you’d think he had found surf nirvana. Shaun surfed for another hour or so, trading waves with the other local surfers and, despite the hard downpour so typical of our best sessions, he made every ride look better than his last. In spite of his obvious advantages, Shaun fit right in with our crew: cheering us into waves, sharing waves, complimenting our rides, and offering observations on the beauty of our coast. Like all sessions, this session had to end. Shaun called his last wave, rode it to shore, and gathered with the freshwater tribe to celebrate our collective stoke. We changed back at the shop, loaded the truck, and headed downtown so Shaun could make his evening presentation. Every so often, you have that session where you catch the perfect wave – that unforgettable, slow motion, frame by frame take off, drop in, and long, delicious glide. Some describe this experience as a willful moment, as if one actually channeled the power to attract that perfection with effortless dignity. It’s fun to think we have that power, but maybe it’s just the result of hard work, preparation, and recognizing opportunity when you see it. Looking back, that’s what I think about Shaun’s visit to Milwaukee. His kindness, honesty and pure stoke fit right in with the Great Lakes surf scene and our “wiloha” vibes. Not only is he a surfing legend, but overall an amazing person who took his time out of his day to make lifetime memories for myself and other local surfers. Cheers Shaun! We’re all looking forward to sharing some freshwater stoke with you again sometime soon. Editor’s note: This article was co-authored by Jacob Bresette and Eric Gietzen.